Delightful. We felt very fortunate. This is a comfortable gem tucked away in a convenient location. We enjoyed walking the grounds with our early morning coffee. The hummingbirds were such a delight. We truly felt at home in this lovely environment and planned our days so we could enjoy the sunsets on the casita's outdoor patio. A cozy casa well designed for relaxation and comfort. Great access to the art and restaurant area. 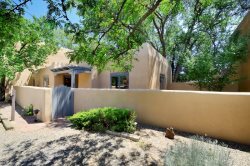 The Casa de Santa Fe team is really there to help you have the best stay possible at the property that you will enjoy most. I would not hesitate in staying with them again. I felt fully taken care of and attended to during our stay. The property was absolutely beautiful, luxurious and relaxing. We felt rejuvenated after staying here and did not want to leave. It was private, with gorgeous grounds, incredible views and amazing amenities. If you are going to stay here, give yourself at least an extra day or two to just be at the property and enjoy all it has to offer. We loved staying in SF and have a great time, mostly out of the property so I can't get too concerned about the details. It was great they had coffee available. We ate most meals out so didn't use the kitchen much. It was clean and neat and nicely decorated. We appreciate the excellent service and prompt response to our inquiries, and the easy check-in after hours. We always thoroughly enjoy our experience while staying in your short-term rentals.